There’s nothing better to wake up to on a Monday than two dastardly handsome new effects pedals. Introducing the Boss RV-500 Reverb and MD-500 Modulation. 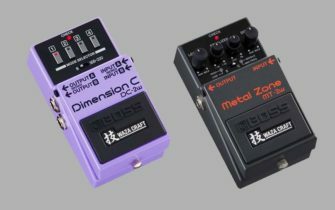 The two new stompboxes expand on the series which began with the DD-500 Delay, undoubtedly one of the most popular delay pedals of the past year. Roland has expanded their pedal catalogue with the Boss RV-500 Reverb and MD-500 Modulation, twin successors to the world-renowned DD-500 Delay. Both pedals are set in the same chassis as the DD-500, making for a clean visual addition to the series. I can already picture the pedal boards with a trifecta of these bad boys up top. Both units run with 32–bit AD/DA conversion, stereo plus MIDI ins and outs, and a USB out for USB/MIDI and software sound editors. The RV-500 boasts 12 modes with 21 reverb types (including Roland classics like the SRV-2000 Reverb and RE-201 Space Echo) with some extensive editing parameters. The MV-500 includes a ton of new Boss-developed effects as well as vintage classics like the CE-1 Chorus Ensemble, Roland Dimension D, 70s script phaser, 80s tri-chorus, and numerous others. Both pedals also include a dandy looking ‘Simul’ mode which allows you to use two reverb/modulation patches at once. Yummy.